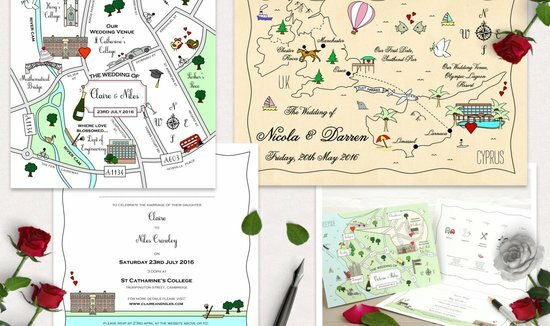 If you're looking for a unique idea for a save the date card, personalised gift, 'we're moving' card or invitation for a special occasion, Cute Maps might just be the answer. 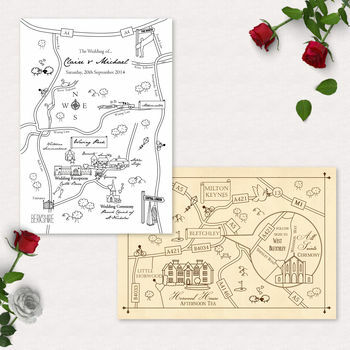 Cute Maps are utterly bespoke whimsical custom map designs that impress guests and also leave a lasting keepsake of your special day, be it your wedding, birthday or christening. Our colection ranges from simple postcards to full stationery suites so there’s something to suit all tastes and budgets. Stationery is printed on high quality textured card and include laid envelopes to give a luxury finish. Colours and fonts can also be tied in to match your design schemes creating a seamless, yet interesting twist to your stationery suite. 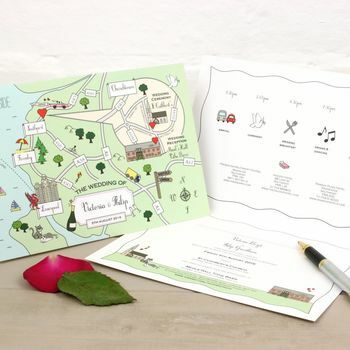 "The help and care given by Cute Maps to get the wedding invites that we wanted was terrific. Felt very well looked after and have received so many compliments on the invites." 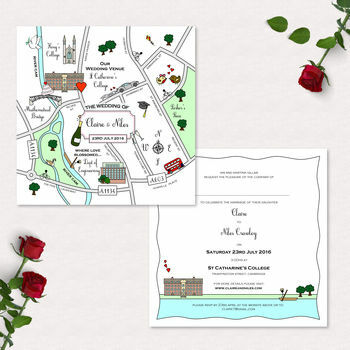 "Absolutely fabulous and just what I had hoped for"
"Thrilled with the invitations! Excellent service. Everything as I'd hoped for." "The product was better than expected, a really personal invitation which allowed us to include many elements including how we met and where we got engaged, as well as important information about our wedding day. Throughout the design process, Sheree was really helpful and receptive to our ideas, even though we thought they would be quite hard to integrate, but she did a wonderful job on our design and we were really happy with our final draft. Turnaround was prompt and clear on communication. The production is high quality and we can't wait to start sending our these invitations!" Step 1: Following you placing your order, an order form will be emailed to you to fill in so creation of your map can begin. Please fill in as much information as you can, ensuring you indicate all locations (up to 5) on your order form (shifting and rescaling of your map will incur additional costs after the issue of your first proof). Step 2: When we have received your order form back we will email you a confirmation and begin work on your Cute Map. For design only orders, unless a custom size is requested, your Cute Map is designed to fit the standard A4/A5/A6 size in either landscape or portrait depending on which works best with your locations. Please indicate on your Info form if you have a preference. Step 3: Your first proof will be emailed to you within 14 days. At this point you can advise of any small tweaks (see terms below for a guide to small tweaks). After we have made any amendments, we will issue your final documents, or send your Cute Map to print (if you have ordered postcards, greeting card, magnet etc). 5 day proof fast track orders are possible - please enquire. Step 4: Enjoy your Cute Map! You will be deemed to have read, understood and agreed to these Terms and Conditions by placing an order with us. Please read, understand and agree to these Terms and Conditions carefully. References to "the customer", "you", and "your" means the person placing the order and/or completing the order form. Following placing you order and submitting your payment we will send you an email confirmation followed by an order form to begin the design of your Cute Map design. Following submission of you order form we will begin to design your order which can take up to 14 days or 5 days for a fast track order. A contract between you and Cute Maps for the sale of our products will only exist once an order has been accepted and confirmed. Prices are kept reasonable as they are calculated on design times attributed to an initial proof and, if required, a second proof with small reasonable tweaks. Therefore, large redesign requests, additional design requests and lengthy changes following the first proof incur the additional design fee of £55. Shifting and resizing also incurs an additional cost of £55. Small reasonable tweaks are free of charge. Prices and availability of goods are subject to change without notice. A delivery charge will be added to your order value, please see the product pages page for further information on delivery and delivery charges,. We make every effort to display through this website all items in our current range. We aim to fulfill orders in given time periods outlined in our product descriptions. However, due to reliance of third parties for printing etc, occasionally an item may be delayed. By agreeing to our Terms & Conditions you accept that Cute Maps is not liable for any costs incurred resulting from the delay of your order. Regarding delivery, no liability will be accepted by us for any loss or damage (direct or indirect). The customer can cancel the order within 24hrs or payment or if they haven't given payment in full. Once payment is received, the order is considered confirmed and the design process begins. Payment is non-refundable once received by Cute Maps. At the time of publication, we attempt to be as accurate as possible when describing products on the website. However, to the extent permitted by applicable law, we do not guarantee that product descriptions, colours or other content available on the Website are accurate, complete, reliable, current, or error-free.In addition, Representations of colours are approximate, due to the limitations of photographic and printing processes. We cannot accept any responsibility for any variation in colour caused by the browser software or computer system used by you. All designs created are intended to serve as an artistic rendering and so will not be created to scale. By agreeing to our terms and conditions the customer accepts this. To the fullest extent allowed by law and save as provided above, Cute Maps shall be liable to you by reason of any representation, or any implied warranty, condition or other term, or any duty at common law, or under the express terms of the contract, or in negligence (whether on the part of Cute Maps or any of its members, agents, directors, employees or otherwise) for any indirect special or consequential loss or damage (including but not limited to loss of profit or loss of saving), costs, expenses or other claims for compensation whatsoever which arise out of or in connection with the use of this website, the supply of the products or their use or resale by you. The limitations of liability in these Terms and Conditions shall apply equally for the benefit of Cute Maps as if references to Cute Maps. While Cute Maps makes reasonable attempts to ensure that the information on this website is accurate and up to date, it does not give any warranty as to its accuracy or completeness and Cute Maps will not be responsible for any errors or omissions or for the results arising from the use of such information. perform, any of its obligations in relation to the products ordered by you if the delay or failure was due to any cause beyond its reasonable control. Cute Maps does not seek to exclude or limit liability for death or personal injury arising from its negligence or that of its members, directors or employees or for any fraudulent misrepresentation. The extent of any liability of Cute Maps arising under the contract for the supply of Goods to you shall not exceed the price of the Goods, except as expressly provided in these Terms and Conditions. Cute Maps may assign or transfer any of its rights or sub contract any of its obligations under these terms and conditions to any third party. You may not assign or transfer any of your rights or sub contract any of your obligations under these terms and conditions except with the specific permission in writing of Cute Maps. No person who is not a party to these terms and conditions shall have any right to enforce any term under the Contracts (Rights of Third Parties) Act 1999. This does not affect your statutory rights. Any artwork, images, or text supplied and/or designed by Cute Maps on behalf of the customer, will remain the property of Cute Maps and/or it's suppliers. © Cute Maps. All copyright, design rights and intellectual property rights existing in our design and products and in the images, text remain the property of Cute Maps. Any violation of these rights will be pursued vigorously.